If you have read any of my previous posts about Southwest Airlines, you might know that I am a huge fan of this airline. The easy-to-use frequent flyer program, no change fees, no baggage fees, and great customer service are all reasons I fly Southwest Airlines whenever I can. Of course, we all know you can use Rapid Rewards points to purchase Southwest flights, but did you know that you can use your Southwest points for gift cards, shopping, experiences, hotels, and more? My guess is no, because this feature isn’t well-advertised, and it’s not easy to stumble upon on their website. In this post I will show you all the unique ways you can use your Southwest Rapid Rewards points, and whether or not these options are a good use of your points. First let’s talk about how you find all these options on the Southwest website. You need to navigate to the More Rewards portal; here’s a quick step-by-step to get you there. First, click on Rapid Rewards in the upper right corner. Then click on Redeem for More Rewards. Next, you will need to click on Shop Exclusive Offers if you are a Rapid Rewards credit card holder, or Shop Rewards if you do not have a Rapid Rewards credit card. From here you will be able to see all the things you can purchase with your Rapid Rewards points. 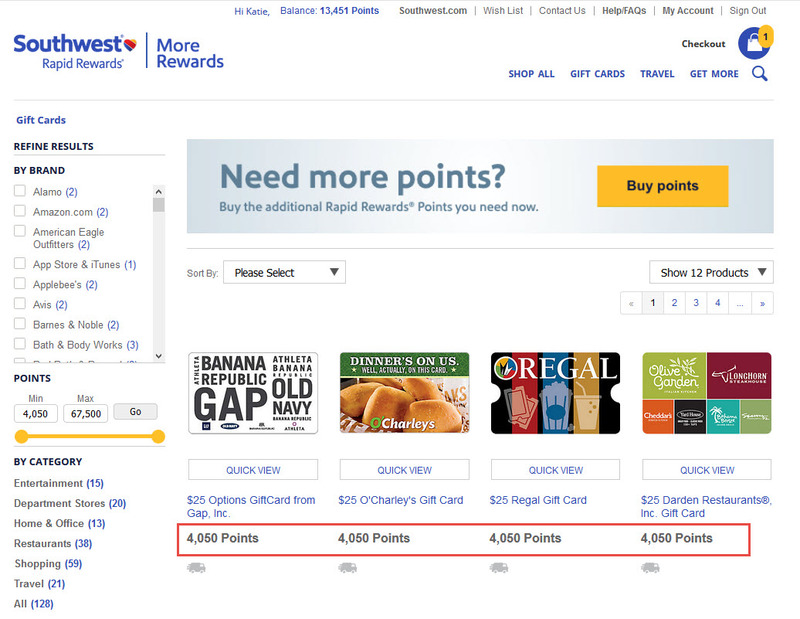 To shop using your Southwest Rapid Rewards points, go to the More Rewards portal and select Shop All on the top menu bar. Each category has different subcategories. Click on one to see all of the items available. This brings up a typical shopping page; you’ll see all the items available are listed in the main section with filtering options to the left of the screen. The only difference is that the prices are listed in Rapid Rewards points instead of dollars! To purchase an item, click on the item then click the yellow Add to Shopping Bag button. You may be prompted to log in to your Rapid Rewards account if you aren’t already logged in. Confirm your order and click Continue. Enter your shipping information and click Continue again. Click the yellow Submit Order button to complete your order. Orders can not be canceled once placed, so be sure everything is correct before you submit your order! If you prefer not to order online, you can also order over the phone. Call Southwest on 800-833-4861 Monday-Friday from 7:00 a.m.-7:00 p.m. Central Time to place an order. If you are unhappy with an item purchased through the More Rewards portal, you can return it within 30 days of the ship date. To return an item, you must call customer service at 800-833-4861 for a Return Authorization (RA) number. This number must be included in your return. Gift cards can not be returned. If you receive a damaged item, contact customer service at 800-833-4861 within 24 hours of receipt. The value you will get for your Rapid Rewards points when shopping through the More Rewards portal varies. I searched lots of products, and the value varied anywhere between 0.2-0.7 cents per point. When you consider the fact that you will get about 1.5-1.7 cents per point in value when using your points to purchase a Southwest flight, you see that these are not great deals. 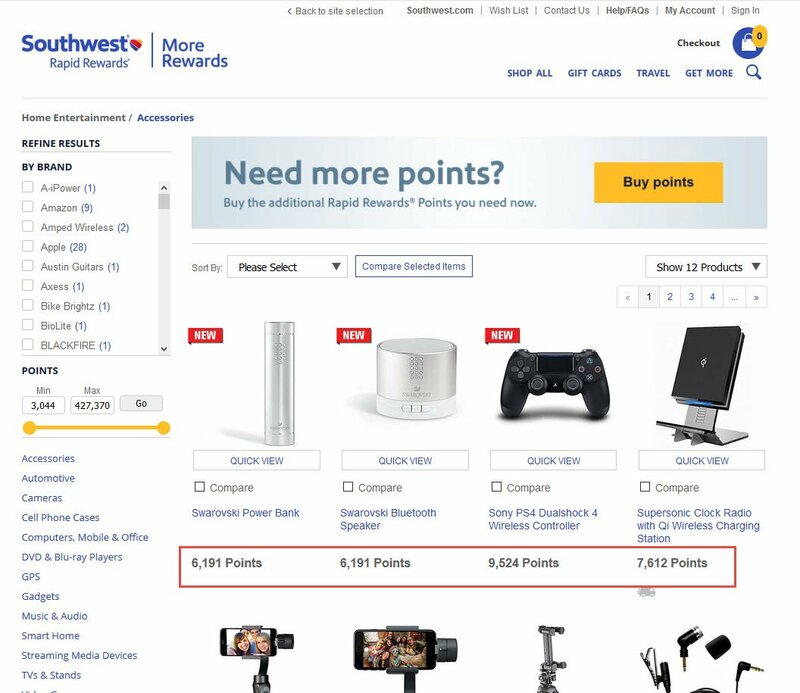 Bottom Line: You can shop for merchandise using Rapid Rewards points online at www.southwest.com/morerewards or by calling 800-833-4861. However, the value isn’t great — you will usually get between 0.2-0.7 cents per point. Gift cards are another item you can purchase through the More Rewards portal using your Rapid Rewards points. Go to the More Rewards portal and select Gift Cards on the top menu bar. You can search for specific stores or categories using the filtering options at the left, or just scroll through the available cards in the main section of your screen. The price for each gift card will be listed in points instead of dollars. Click on the card you would like to purchase to see details and finalize your transaction. When using Rapid Rewards points to purchase airline tickets, you will get about 1.5-1.7 cents per point in value. So a $150 ticket would generally cost between 8,800-10,000 points. These $25 gift cards cost 4,050 points, which is only a 0.6 cents per point value — that’s less than half the value you would get using your points to purchase a flight! Generally, using your points to purchase gift cards is not a good deal! There could be a few occasions when it might make sense, but these times will be few and far between. 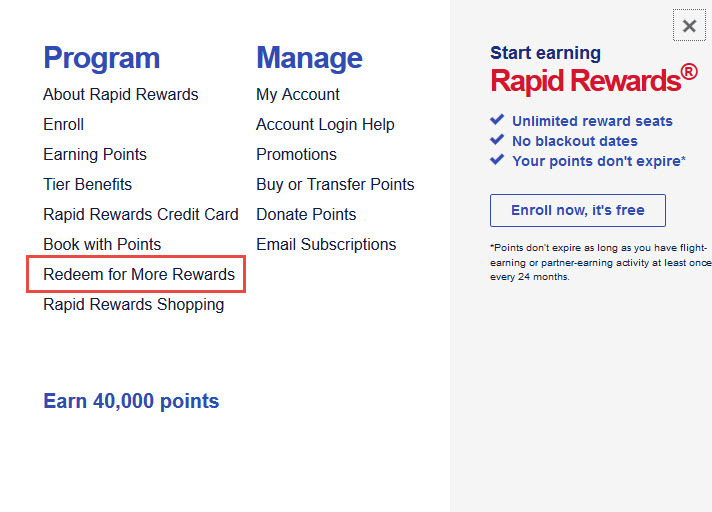 My guess is that if you are an UpgradedPoints reader, you’ll be able to find better uses for your Rapid Rewards points! 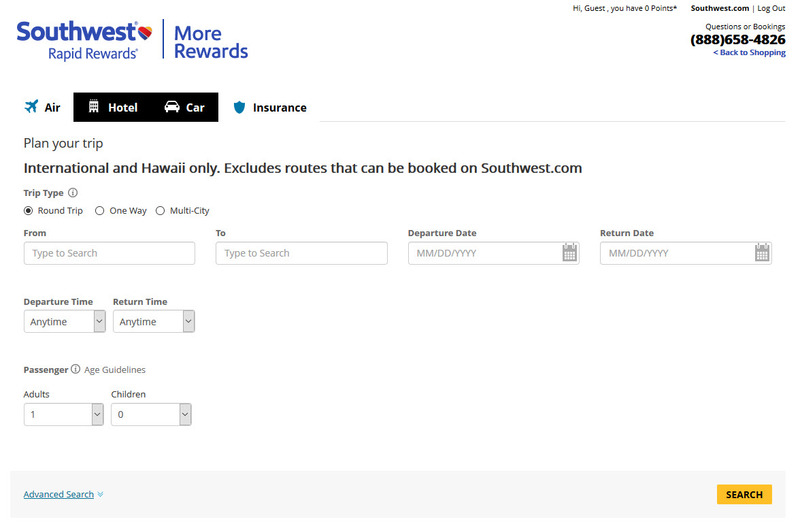 Your Rapid Rewards points can be used to purchase non-Southwest international and Hawaii flights through the More Rewards portal. Go to the More Rewards portal and select Travel on the top menu bar, then Airfare from the drop-down menu. Input your search criteria including departure city, arrival city, dates, times, and number of passengers. Then click the yellow Search button in the bottom right corner. This search results page should look pretty familiar — the search results are in the middle with filtering options to the left. The main difference you may notice is that the price is listed in Southwest Rapid Rewards points instead of dollars. If you don’t have enough points in your account to cover the cost, you will see a Payment Guidelines button that directs you to purchase more points. I did the math on several flights on different airlines to determine the value you can get using Southwest points to book non-Southwest flights. Each time, the value came up as 0.787 cents per point. When booking flights this way, you are barely getting 0.8 cents per point! That’s about half the value you would get by booking a Southwest flight with your points. So, again, this isn’t a great deal. But it’s still good to know all of your options! Bottom Line: When booking a flight through the More Rewards portal, you are only getting 0.787 cents per point in value. This is about half of what you get when booking a Southwest flight with your points. 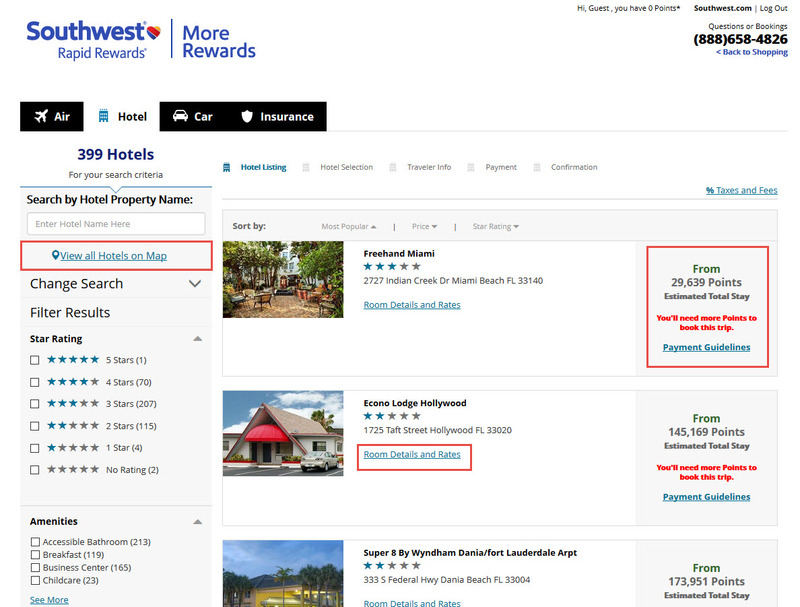 To search for hotels, go to the More Rewards portal and select Travel on the top menu bar, then select Hotel Stay from the drop-down menu. Then enter your basic search criteria including destination, travel dates, number of rooms, and number of guests. Click the yellow Search button to continue. Again, the search results page will look familiar; there is also a map view available. Click on View All Hotels on Map to bring up a map with all of the available hotels pinpointed. This view can be really helpful in choosing a hotel in the exact location you need. 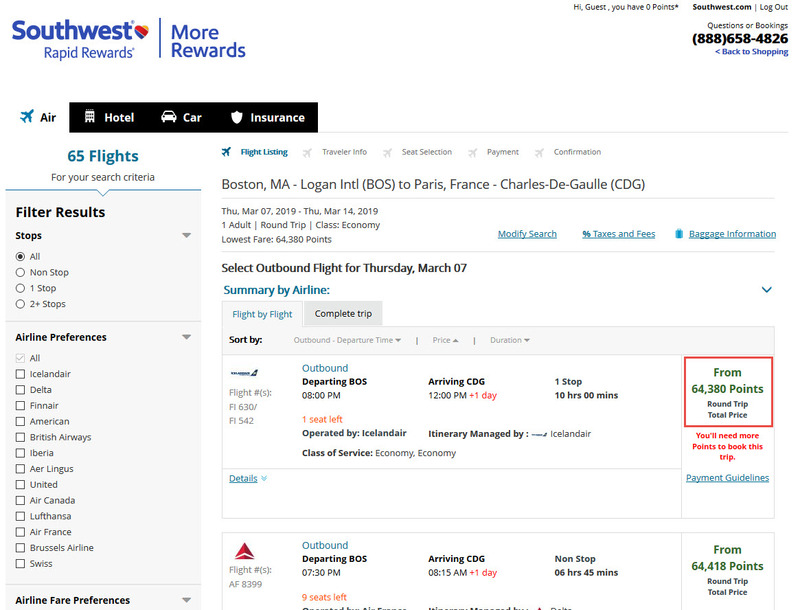 Just as with flights, the price is listed in Southwest Rapid Rewards points instead of dollars. This price is for your entire stay, not just 1 night. If you don’t have enough points in your account to cover the cost, you will see a Payment Guidelines button that directs you to purchase more points. Click on Room Details and Rates for more information about each hotel option. If you have enough points in your Rapid Rewards account (and are logged in) you will see a yellow Select button. Click this to enter your info and complete the transaction. Trying to find a hotel through Southwest More Rewards has some problems. First, be careful what you are choosing — I found that hostels were listed right along with hotels. Also, many of the hotels listed were not actually available to book, but you don’t know until you click on the selection. After selecting Travel on the More Rewards main menu, you can select Resorts from the drop-down menu. Then you will be prompted to call a Resort & Vacation Agent at 1.888.658.4826 to get information about using your points to book a resort. Based on my experience with the More Rewards portal, I would bet that you will not get a great deal using your points in this way. 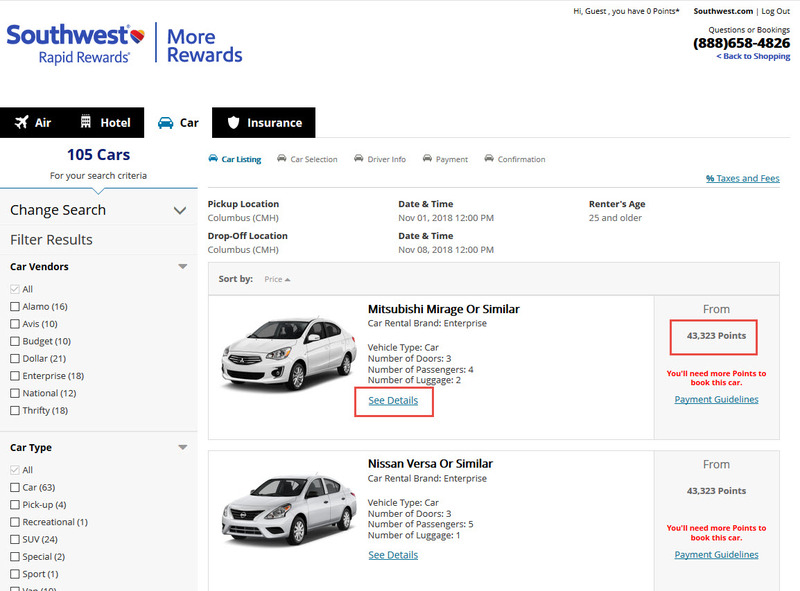 To search for a rental car, go to the More Rewards portal and select Travel on the top menu bar, then select Rental Car from the drop-down menu. Input your search criteria including pick up and drop off location, times, dates, and the driver’s age. To include some more specific search criteria click on Advanced Search — you can specify car type, type of transmission, and whether or not the car will have air conditioning. Click the yellow Search button to continue. The main search results will be displayed in the middle of the page with filtering options to the left. The price will be shown in Rapid Rewards points. Click on See Details for more information, price breakdown, and any additional fees that might apply. Bottom Line: Just as with flights, the value you get renting a car with your Rapid Rewards points isn’t great — you will get .5-.6 cents per point. After selecting Travel on the More Rewards main menu, you can select Cruises from the drop-down menu. Then you will be prompted to call a Cruise Agent at 1.888.658.4826 to use your points. Based on my experience with the More Rewards portal, my best guess is that you won’t get a great deal using your points in this way. Travel insurance is an interesting topic: not only are there different options available, but some would argue that it’s unnecessary. While that’s an entirely separate discussion, it’s good to know that if you choose to purchase travel insurance, you can use your Rapid Rewards points to do so. 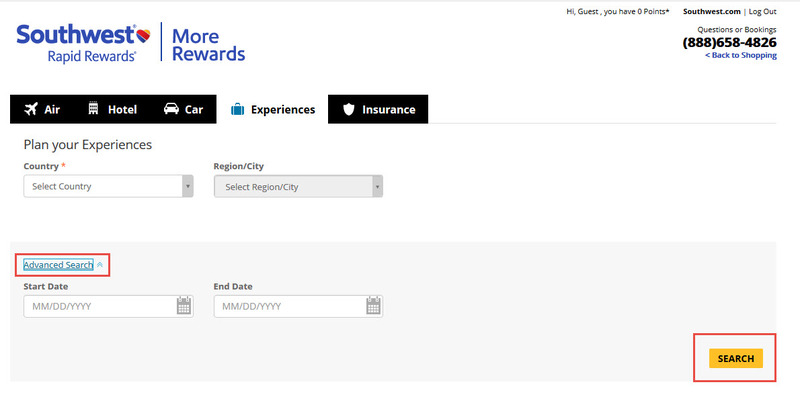 After selecting Travel on the More Rewards main menu, you can select Travel Insurance from the drop-down menu. You will need to input some basic information about your trip and select Search to see what’s available. Before you purchase a policy, be sure to know what you are getting! 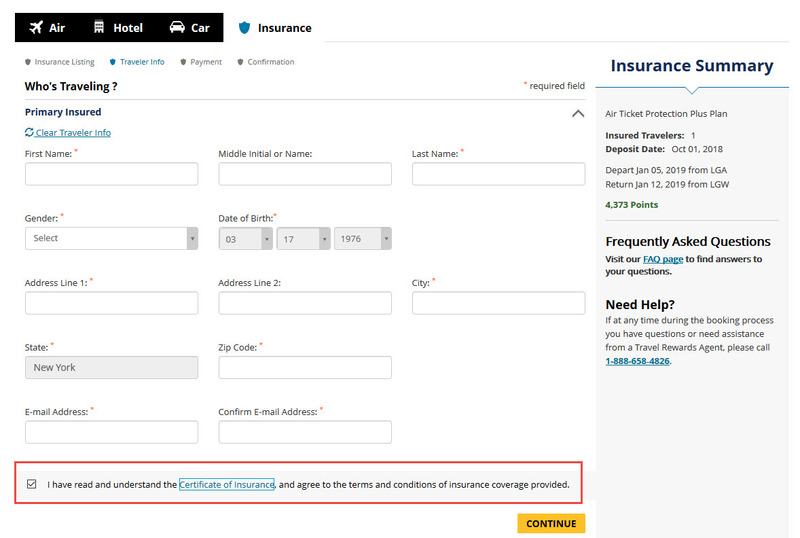 You will be able to read the actual policy by clicking Certificate of Insurance at the bottom of the page where you input your traveler information. Coverage varies by state and is only available to U.S. residents. Don’t forget that many credit cards come with travel insurance! You could have plenty of coverage — including trip cancellation and interruption insurance, car rental insurance, and baggage delay or loss insurance — just by using the right credit card. Bottom Line: Before you purchase travel insurance, take a look at your credit card — many cards offer solid trip insurance at no additional cost. 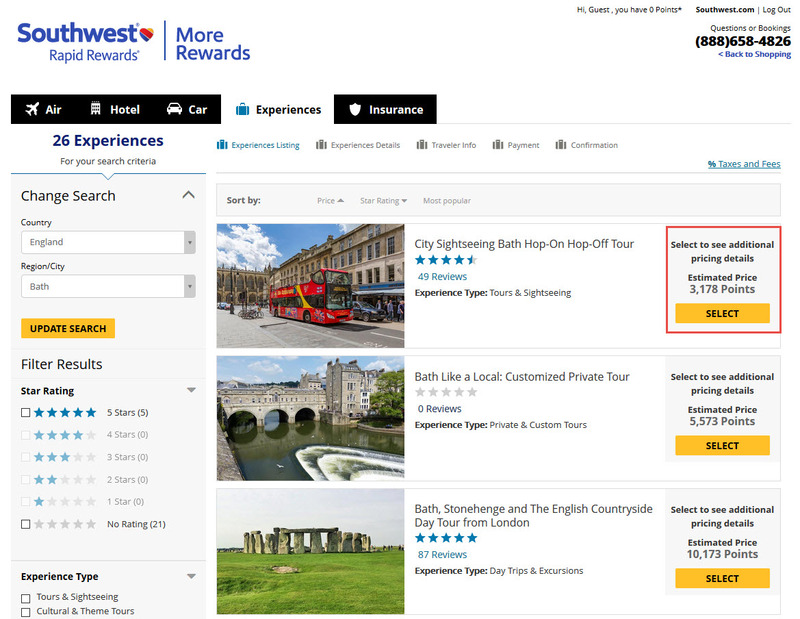 If you are interested in booking some excursions for your next trip, select Travel on the More Rewards main menu, then choose Experiences from the drop-down menu. Fill in your destination country and city. To input your travel dates, click on Advanced Search. Then click the yellow Search button to continue. Here you will see different tours and excursions available in your city in the main section of your screen. 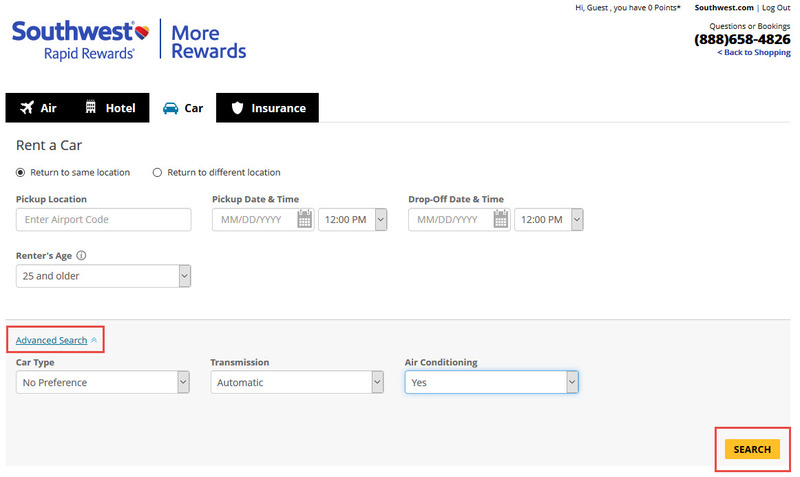 Filtering options will be on the left, and prices are shown in Rapid Rewards points. Click Select to see more information about each tour and complete the booking. Bottom Line: Tours booked through this portal will get 0.62 cents per point in value. The Travel Essentials section lets you shop for travel-related products using your Rapid Rewards points. After selecting Travel on the More Rewards main menu, you can select Travel Essentials from the drop-down menu. Car Rental Gift Cards: These are available for Avis, Budget, Alamo, and National Car Rental. The cost is 6,750 points for a $50 certificate or 13,500 for a $100 certificate. This gives you 0.74 cents per point in value. While this isn’t awesome, it’s better than what you can get booking a rental car directly through the More Rewards portal. The Seasonal section lets you shop for more products using your Rapid Rewards points, though they really don’t have anything to do with being seasonal. After selecting Travel on the More Rewards main menu, you can select Seasonal from the drop-down menu. Universal Orlando Resort 1-Day Park Pass: Based on the online price offered by Universal Studios, this will get you 0.49 cents per point in value. Sea World Orlando Single Day Ticket: Based on the price of a single weekday ticket on SeaWorld.com, this will get you 0.43 cents per point. Carnival Cruise Gift Card: You can purchase a $100 gift card for 13,500 Rapid Rewards points, which is 0.74 cents per point in value. Royal Caribbean Gift Card: Purchase a $500 gift card for 67,500, which is also 0.74 cents per point. While these aren’t the best deals, if you’re flush with Rapid Rewards points and have no Southwest plans in the future, these could be fun ways to use them. At the far right of the main menu, you will notice a tab called Get More. 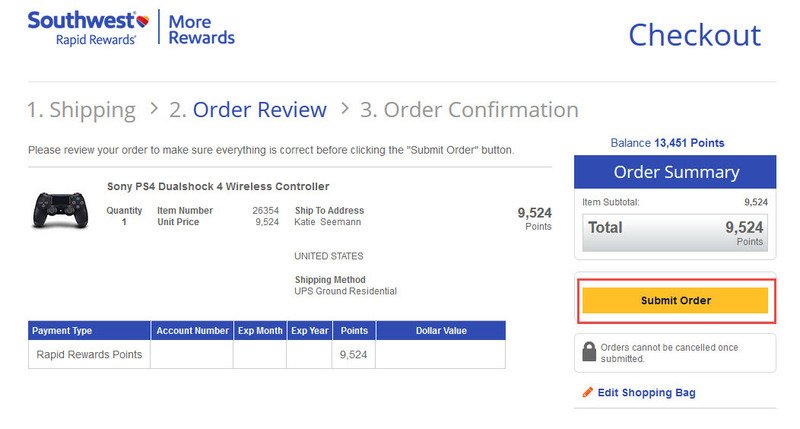 Click Travel Better in the drop-down menu to access even more items that you can purchase using Rapid Rewards points. Here you can shop categories like Pets, Coffee, and Sunglasses. The value you get from your points is just about as random as the items they have for sale here. You can expect to get between 0.4-0.7 cents per point. The highest value is from gift cards, which give you 0.74 cents per point. Bottom Line: Gift cards purchased through the Travel Essentials, Seasonal, and Get More links usually have a value of 0.74 cents per point — this is about half of what your points are worth when purchasing Southwest flights, but one of the better redemption values through the More Rewards portal. 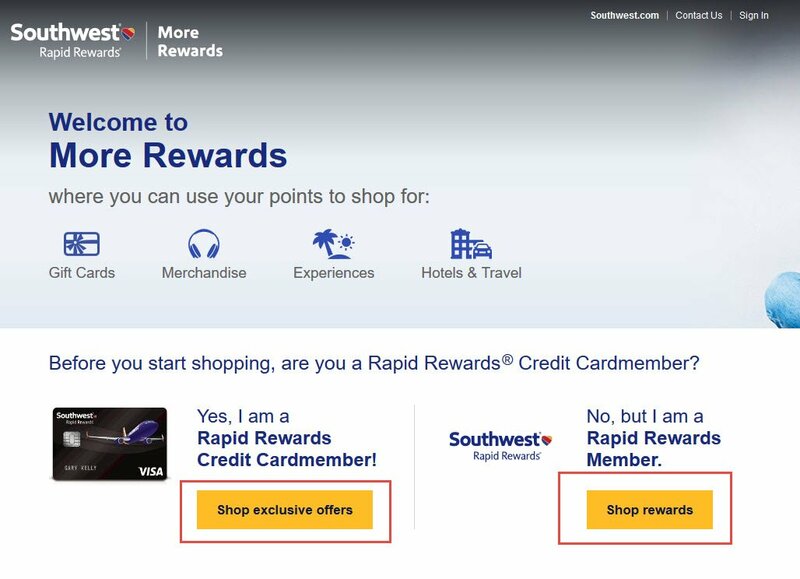 Southwest offers different ways to use your Rapid Rewards points through the More Rewards shopping portal. While the value you will get from your points through this portal is pretty bleak — about 0.4-0.7 cents per point — it’s always good to have lots of options when it comes to using your points. If you find yourself with a stack of Rapid Rewards points and no Southwest travel on the horizon, it’s good to know you can exchange your points for something of value, even if it’s not as good of a deal as using them for Southwest flights. 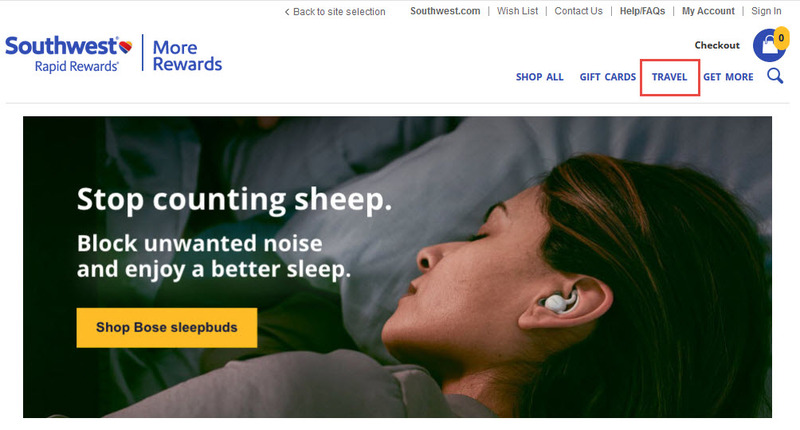 What is Southwest More Rewards? 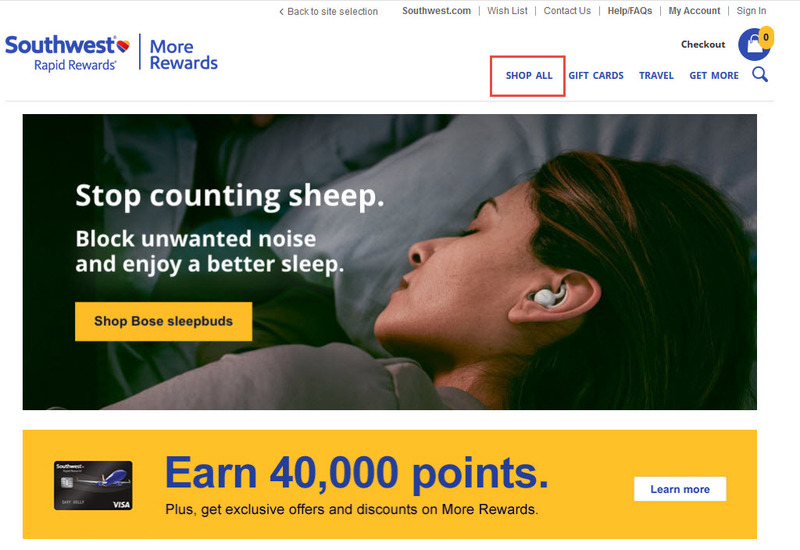 Southwest More Rewards is a shopping portal in which you can use Rapid Rewards points to purchase merchandise, gift cards, flights, hotel rooms, rental cars, and more. 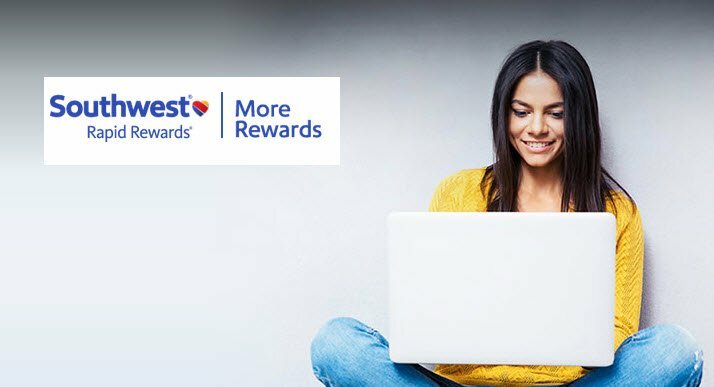 Access the More Rewards portal by visiting Southwest.com and selecting Rapid Rewards>Redeem For More Rewards. 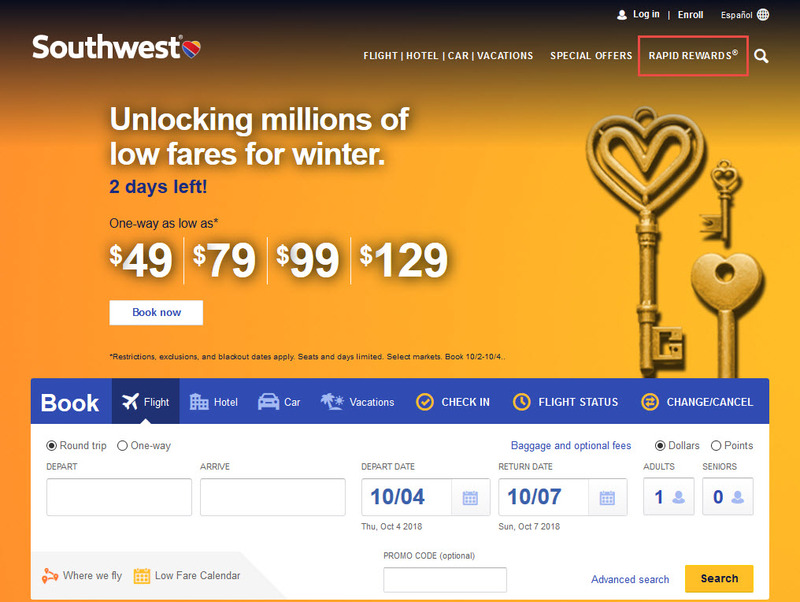 How much are my points worth through the Southwest More Rewards portal? 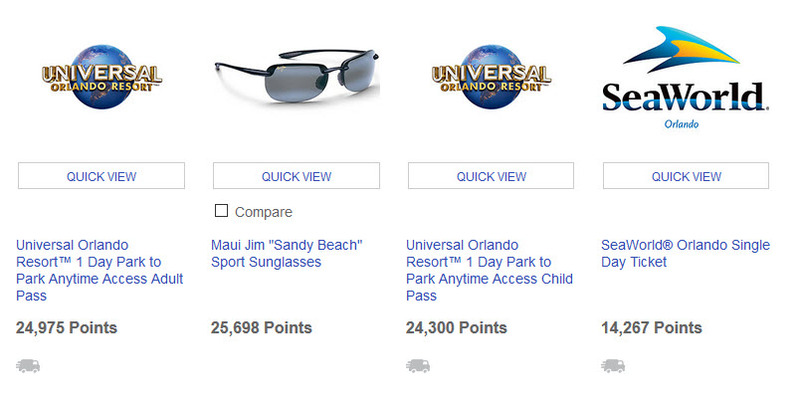 Your point value will vary depending on what you are purchasing in the More Rewards portal. Expect to get between 0.4-0.7 cents per point in value. Sending this to my uncle ASAP, since he has so many points to use.